Looking for the Best Gaming Keyboards? Among the long list of essentials, you can’t overlook gaming keyboards. When playing for long hours, you can’t help but appreciate the extra level of comfort it creates. Finest and smooth gaming experience are guaranteed along with it. Effortless play even in lengthy gaming durations is a real prospect. There are lots of good quality gaming keyboards out there on the market. To make your job easier to pick the best one, we have sorted the best from the rest. But before we go further ahead we would like to point out some Important Factors to consider before you choose your pick. Many people swear by mechanical keyboards, and that’s due to their individual key switches that work independently from each other. This makes them more responsive, feel less mushy, and some would argue more accurate to type/game on. Whether or not you see this as a must-have feature is entirely down to your own personal tastes, but RGB lighting can add a much-needed dash of personalization, color, and excitement to a keyboard. There are plenty of features to think about, some of which are found on the higher-priced keyboards. These include a wrist rest; a removable cable (these are often a braided design for durability); USB and audio pass-through; dedicated media and macro keys; a volume wheel; and, last but not least, bundled software that allows you to customize your keyboard’s performance and/or lighting array. Keeping the above in mind we can now move in forward into the compilation. Redragon is a well known and most trusted brand when it comes to offering high-performance gaming devices. The Asura K501 in particular keyboard is very slim and key height is also very less lowering your typing efforts. It also has a palm rest which betters of comfortably long gaming sessions. The chiclet keys come with the matte finish and overall build quality of this device is very good. The keys are not mechanical though, which would’ve made this a better deal. Like other gaming keyboards, it has gaming mode which disables windows keys, It doesn’t have mechanical keys. Next up on our list of the Best Gaming Keyboards is the Truecase M 200. You would instantly fall in love with the build quality and attention to design details of Truecase M200. This gaming keyboard offers a nice feedback and key presses have a nice clicking sound. It has dedicated media keys, which proves to be quite a useful feature. This one does not have the anti-ghosting feature, but we faced no issues playing games for longer sessions. Compared to all other keyboards here, M 200 doesn’t come with windows lock key, or fancy feature like palm rest, which might be a deal breaker for some, but the addition of gaming keyboard makes it a totally worth a buy for first time gaming keyboard users. Coming in at the third position of our Best Gaming Keyboards is the Circle Adroit. 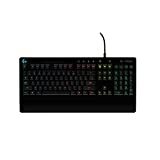 This gaming keyboard features LED backlighting with 7 different color options. The color of the LED can also be customized. The Keyboard is sturdy and it is really good to type with. The build quality of X7C is also pretty decent. It is one of the best gaming keyboards in this budget range. The low profile keys and ergonomic design make the keyboard looks modern. The cable is very durable and its quality is really good. The low-profile design makes it comfortable for typing. Fourth on our list on the Best Gaming Keyboards is the Redgear Blaze 3. This gaming keyboard features multimedia keys at the top, which are really convenient while playing media. The keyboard comes with LED backlighting. The LED color can be changed to 3 different color options. So that you can match your keyboard with your setup. The most important feature of this keyboard is that it features anti-ghosting for a better gaming experience. The Redgear Blaze 3 is quite sturdy and it is convenient as it has a good grip on the bottom hence doesn’t move about. Next up on our list of the Best Gaming Keyboards is the Night Hawk NK101. It is a nicely built keyboard especially if you are tight on the budget. It has 3 back-lit color settings to choose from, has rigid chiclet-style keys swappable WASD & arrow keys and has big palm rest. Kind of all the good things is packed in this good-looking gaming keyboard at an affordable cost. The features like anti-ghosting & Windows key lock are also not left out. The typing or using this keyboard gives a smooth and soft experience, in fact, most smooth of all the gaming keyboard we mentioned in this article. On the 6th spot of our Top gaming keyboards is the Logitech Prodigy. It is a very sturdy and reliable keyboard from a trusted brand. The G213 gaming keyboards come with the custom color RGB back-lighting, which means you can choose any color you want to back-light your keys. It has a plastic body with matte finish, so keys are smooth and they don’t catch much of the fingerprints on them. This performance keyboard comes with anti-ghosting and 18 ‘G’ keys for you to assign a special task with a single press or more complex tasks ( like combos), using multiple keys together. The big-size palm rest avails the comfort level, that lets you utilize this keyboard for longer gaming sessions, without any issue. Making it to no 7 on our list of the Best Gaming Keyboards is the Cosmic Byte CB-GK-02. This is also one more well-built and keys feel softer to use. It has a blue back-light which is very dim even if you increase its brightness to the highest levels. It has a detachable wrist rest which is a good design consideration. Keys comes with the matte finish which doesn’t catch your prints or dust. It comes with a volume knob that lets you quickly adjust the volume, and looks unique. Similar to G510S, this keyboard also has Windows key lock which de-activates windows keys, and also the offer anti-ghosting technology. Therefore, all your key presses are registered precisely. The Havit HV-KB371L finds itself on the eighth spot of our Best Gaming Keyboards countdown. This gaming keyboard features anti-ghosting which is very convenient for gaming. The keyboard comes with 7 programmable buttons and they can be programmed by the using the software. This keyboard has LED backlighting, but sadly it has no color options. The only color you get is Red. The design of this keyboard is pretty unique and build quality is also good. This keyboard will go perfectly with any of the Red-Black themed gaming setups. Ninth and the third keyboard from Redragon of the list of the Best Gaming Keyboards is the Karura. The Karura is one of the top-rated budget gaming keyboards on Amazon. It has an ergonomic design and backlit system enabled that supports 3 colors. It is durable and has a good polling rate of 1000 Hertz. X7C has an impressive keystroke lifespan of 10 million. The Redragon Karura has six dedicated keys for launching multimedia applications and default Windows software. It has 19 anti-ghosting keys and requires 5.5 Volt power. X7C weights about 1100 grams. It has an intelligent independent lock. Last but not the least we have the Redgear MK881 on our Best Gaming Keyboards list. This keyboard is not that much great when it comes to built quality but every model does have some flaws. It’s all plastic. At the same time, it has a lot of features that make it an amazing product and a viable option. The keyboard does have macro keys, USB pass through and an audio pass. Its kinda expensive as compared to others but with low built quality. It is preferred to those gamers who value style with gaming. Above were our picks for the Best Gaming Keyboards we found online. Keeping in mind the above discussed and choosing any one of the following in accordance should keep you in good stead. Hope this list of the Best Gaming Keyboards helped you in finding the partner for your desk.